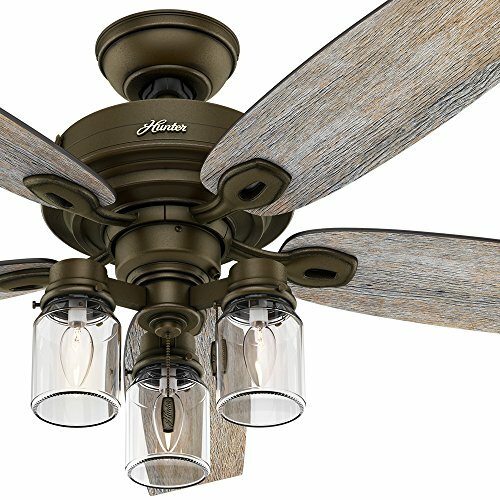 Hunter Fan 52'' Regal Bronze Ceiling Fan includes Three-light Fitter with Clear Glass, 5 Blade (Certified Refurbished) by Hunter Fan Company at F LED Lights. MPN: CC5C33C31. Hurry! Limited time offer. Offer valid only while supplies last. This fan brings together a variety of styles such as farmhouse, rustic, and industrial in a unique arrangement that fits with a wide range of décor. This fan brings together a variety of styles such as farmhouse, rustic, and industrial in a unique arrangement that fits with a wide range of décor. The mason-jar-inspired glass around exposed bulbs will liven up the room, while the distressed finishes give this fan a classic weathered appearance. The clear, incandescent bulbs and 52-inch blade span provide the right amount of lighting and air movement for standard and large rooms.